Don't be fooled by other properties saying they are near or a short distance to Seaside. This perfect 3 bedroom home sits in the heart of Seaside on East Ruskin Avenue and is located less than 5 houses from the beach. Walk out of the back of the house and you are in downtown Seaside literally 25 yards from everything. The location is fantastic for you to enjoy all the benefits of Seaside. 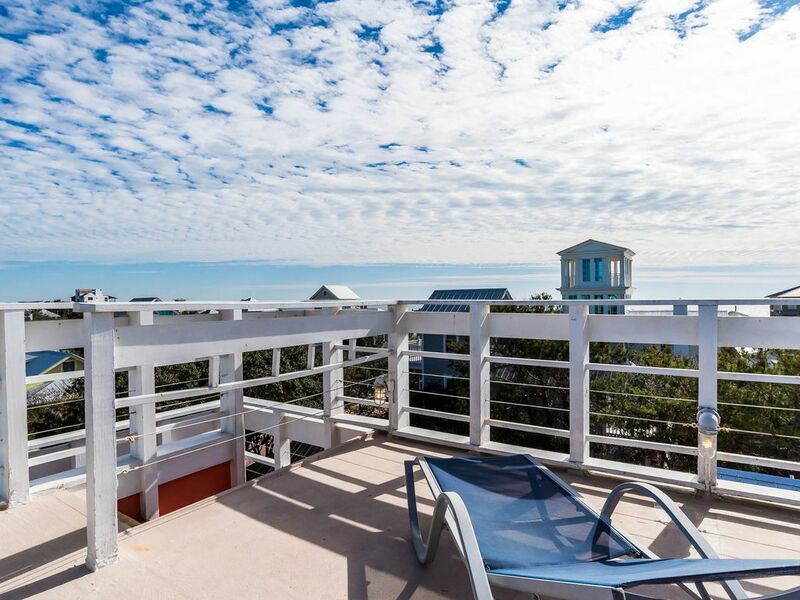 Enjoy the best views in Seaside from the top deck of this metropolitan home featured in Spanish and German Architectural Magazine. The home includes 3 comfortable bedrooms. Two bedrooms have full beds and one has a set of twin beds. We also just added two pullout sofa's for that little extra room that might be needed which is an additional two queen beds. The Master is on the third floor with great views of Seaside and the Gulf. The two twins are on the first floor and the other queen bedroom is located on the second floor. The house prides intself with decks galore and a spacious sitting areas for family and friends on both the second and third floor. Each bedroom has its own designated bathroom. Walk from the 2nd floor straight into the shutter room to enjoy those lazy summer afternoon on the deck in the shade. Wireless Internet is provided. We also provide you with either daily pool passes or a set of beach chairs set up every day for your use during the summer season only. (Early June to Labor Day) Out of the summer season you can purchase pool passes, we have taken them out of our pricing to save you money just in case it's cold and you can't use the pool. Roger's lighthouse also provides (4) bikes for your use so no expensive renting of bikes are needed. This will save you over $500 for a weeks stay. Please check the calendar, it is updated everyday so please check it for availabity. Discounts for multiple week bookings only. Make your next Seaside vacation at Roger's Lighthouse. *During our summer season we book Saturday to Saturday only. Sorry no exceptions. Normal check in time is 4pm CST and check out time is 10am CST. We do try our best to accommodate any requests. We really enjoyed our stay and this was a fantastic location close to the beach and all of the amenities of Seaside. The home’s unique layout and outdoor deck options were particularly enjoyable. The only reason for 4 stars was the age of the bathroom, kitchen and a few other features. Very usable and we like the rustic feel. Great experience. Loved the architecture and the colors. Property very well kept. Clean and freshly painted. Great amenities. And location was fantastic, right next to the beach. We hope to see you return very soon. Thanks for visiting 30A. Fantastic location and lots of character. Some warmer weather would have been nice for our stay in Seaside, but the house was very nice. Exactly what we were expecting. Great location just a block from the town center and beach. House is a little quirky with lots of character....and very clean. Use of the bikes was very nice too. Thank you for a good stay. The best way to experience Seaside!! We have just spent our second time at Roger's Lighthouse and it was even better than the first (which was wonderful). Perhaps it was partly because it felt a little like coming home to a comfortable familiar place. We also appreciated even more how special the house is and our time there. It is the perfect location for a quick visit to the shops and restaurants. We love to walk and the variety of walks from the beautiful beach to exploring all the streets in Seaside and the great nature walks never got old. One of my favorite activities was reading in the pavilion overlooking the beach - also a popular gathering spot for watching the sunset. The house is very comfortable and well equipped. Bicycles and beach chairs were available along with beach towels. The bedrooms are all full of light, cheerful and very comfortable. The shutter room is a unique experience!! I cook a lot and the kitchen is very well equipped. I appreciated the thoughtfulness of spices being available. We often started our day on the rooftop watching the sun rise and I returned at times to look at the stars at night. A wonderful place to create wonderful memories!!!! Thank you for your review. We look forward to seeing you return in 2020. Roger's Lighthouse was in a fantastic location. Easy Beach access, restuarants & to the pool. The house is the ideal beach house for spending time withyour family. Would absolutley rent it again! The location is perfect, steps out the backdoor thru the old bungalows and you're in the town square while only 4 houses down from the East Ruskin beach pavilion. Note, this beach area is literally a fourth as crowded as the main Seaside access as its owners only so we only had a single row of chairs/umbrellas to their 4-5 rows. The family/adult pools, playground and tennis courts were a super short few minute walk from the house. The larger outdoor pool was an easy 3 minute bike ride away. The shutter room and front porch is where we spent most of our time, both we're very nice. Kids loved the outdoor tv in the shutter room and it stayed surprisingly cool in there with the fan on. We never touched the AC from its initial setting of 72 and I have to say the home kept a cooler and more constant temp than much newer beach homes we've rented in the past. The interior and furnishings were more dated than we expected but it fit the laidback vibe of Seaside and we did truly enjoy our week in the Lighthouse after getting settled in. Note, we were confused and expected a seperate bathroom in the upstairs master bedroom but it is all one open room with the shower a few feet away from the bed and you access the toilet thru the shower. Not a huge issue ultimately but we were surprised so just fyi. If you want a newer feeling, fully updated space this may not be for you but if you want location, amazing outdoor spaces and are ok with a clean yet more dated space with a laid back vibe this is the spot. Roger and Renee were great to work with, very responsive and quick to reply to all messages and needs. I cant imagine a better location in Seaside or a better view from the top tower which was my wife and I's favorite spot to enjoy a drink while looking over the gorgeous town! Thank you again to Roger and Renee!